Pinhole glasses may help by focusing and strengthening the muscles around the eyes. Eyesight can be improved by wearing these glasses for 15 minutes a day. 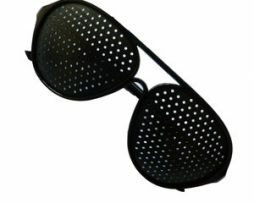 Pinhole glasses are made up of a grid of tiny holes that cause the muscles of the eyes to focus. In a well lit room you will see an instant improvement in sharpness of images. Activates your natural vision ability. For use reading or watching TV, please do not use for anything else as pinhole glasses can reduce peripheral vision whilst they are worn.